Magnets are dip-cut to allow for extended pole piece excursion and high output. Speaker grills are included. These 6.5-inch high-power R-652N speakers are a great way to upgrade the sound in your vintage. They use a neodymium magnet structure for high power handling in a slim-mount design - mounting depth is just 1.8-inches (51mm). Santoprene® surrounds deliver the most natural sound possible with no distortion. Mylar tweeters produce crisp, clear highs. Speaker grilles are included. Reduces road and wind noise plus lowers heat from your vehicle. Easy to cut 1.4mm thick matting with odorless self-adhesive backing. 3-ply construction: Butyl Rubber Membrane and Closed Cell Foam reduces exterior noise along with squeaks and rattles, Aluminum Sheeting provides thermal insulation and Strong Bitumen Adhesive combine for maximum quiet and easy installation. •Great for Door Panels, Floorpans, Trunks, Speaker Kick-panels and more. •Easy to apply (peel and stick), only 1.4mm thick. 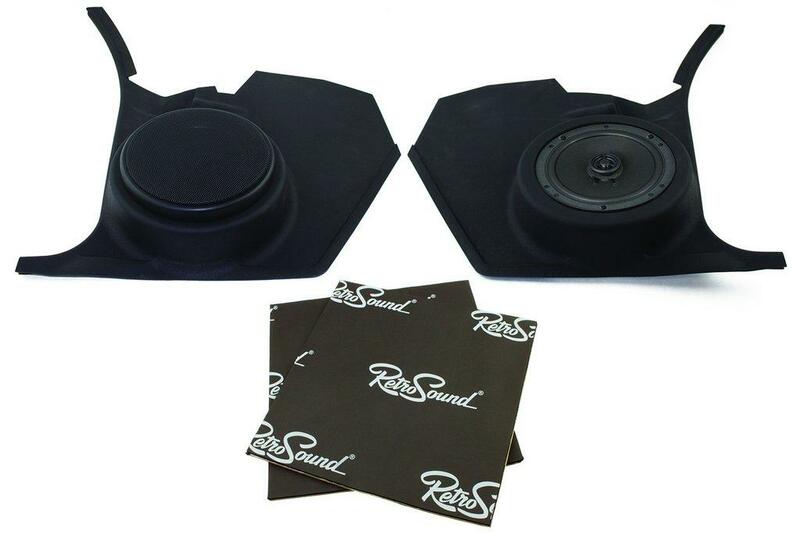 These RetroSound® kick panels mount easily in your classic 1968-72 Pontiac GTO, and will fit most 6.5-inch speakers. They are injection molded for a perfect fit in vehicles without factory air conditioning. Includes driver's side and passenger side kick panels. You can use vinyl paint or plastic adhesive paint to match the panels to the color of your vehicle's interior.